Michèle Oberdieck is a contemporary textile and glass designer (BA Hons in Printed & Knitted Textiles, Glasgow School of Art, MA Royal College of Art in Ceramics and Glass). For 12 years she ran her textile practice from her shop and studio in the Oxo Tower in the South Bank, and has taught as a visiting lecturer at a number of art colleges. Michèle has designed collections for both fashion and interior markets, as well her own label. The printed textile classes will be conducted at The Art Stables in north London, near Finchley Central. I was taught about screen printing on textiles. This included paints and textiles and how both influence each other. We then practiced printing. We learned how to prepare for screen printing, both the screen and the textile and the printing area. How to print and how to clean the screen, dry and fix the colour to the textile. Michele, showed us examples of textiles that were screen printed and explained how those prints where achieved. There is a large variety. We were taught how to create patterns for printing and what works well with which method. We printed those patterns and analysed the prints afterwards and who we could adjust them to create a different impact with colour and placement. We were encouraged to try different effects with the same patterns. I really enjoyed the workshop. It taught me to think differently about textile printing. I have used digital printing before but I enjoyed the actual creating a lot more. 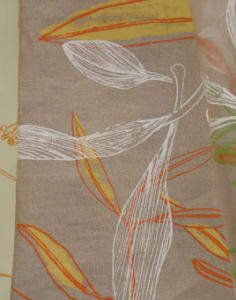 Michele is an excellent Textile designer with a lot of experience . I will attend more workshops of hers in future to continue improving.